Security Archives | Markham Garage Doors Ltd. Your garage door is great, eh? It just keeps on working, up and down a couple times a day, every day, year-round, and it’s like you never have to think about it. Every homeowner knows that, when it comes to maintaining the house, “there’s always something”. But that something never seems to be the door on the garage. We hate to be the bearer of bad news, but the incredible dependability of your garage door might be costing you money. Intentionally or not, most homeowners live by to old adages: “if it ain’t broke, don’t fix it” and “the squeaky wheel gets the grease”. While these are good guidelines for a lot of the maintenance around the house, they don’t apply very well to garage doors for a number of reasons. While your garage opens and closes to let your car, or anything else, in or out of the garage, it’s a mistake to think that’s the only function of the door. In addition to its everyday operation, garage doors also help insulate your home, protect your house and belongings and they are usually the largest, single element of the appearance of your home. To tie those functions into the ‘squeaky wheel’ and ‘if it ain’t broke’ guidelines for home maintenance, none of them squeak and it’s difficult to tell if they are broken. Attached garages can have a huge effect on the cost of heating and cooling your home, especially if your old door isn’t well-insulated and properly sealed. Many homeowners treat the garage as being ‘outside’. So, if it’s freezing in the winter and stifling hot in the summer, it’s no different than any other part of your home with an outside wall. Except, by having an insulated door, and insulating any outside walls in your garage, you can significantly reduce your HVAC costs and increase the comfort of your home, especially in areas of the home that are above or beside the garage. And it’s not just energy costs you’ll be saving. Insulating your garage door and walls means less heat entering your home in summer and less cold entering in winter, which means your furnace and air conditioner have less work to do and will last longer before needing to be repaired or replaced. Most people don’t realize how much of an effect their garage doors have on the overall appearance of their home. In many cases, the garage door can account for over 30% of the visible area of a home. That means, even if you spend lots of money to improve the exterior appearance of your house and your landscaping, if the design of your garage door isn’t up to date, or it simply looks shabby, your home will look that way too. If you want to get a better idea of just how much a difference a new door can make to the look of your home, upload a picture of the front of your home to the Haas Create page at HaasDoor.com, which is the website for one of our top-quality garage door suppliers. Once your picture is uploaded you can highlight the area where your garage doors appear and substitute any number of new doors to see how they look on your home. 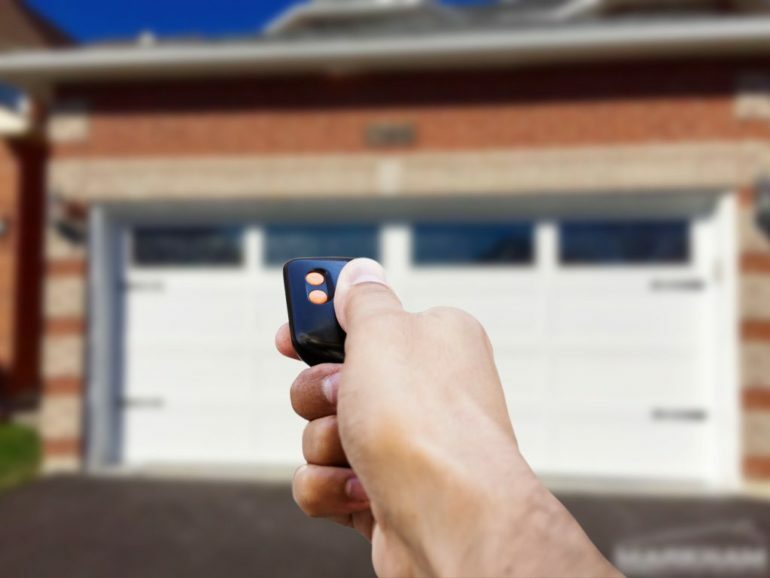 Even if you have a garage door opener and a security keypad, older systems can be very easy for a burglar to get through – and garages doors are one of their favorite ways of getting into a house. If you don’t have a door opener, the simple lock on your door does little or nothing to protect everything you keep in your garage, everything in your home, and your family’s personal safety too. There are lots of other ways a new garage door can save you money and improve the enjoyment of your home. Call us here at Markham Garage Door to learn more. Sometimes it makes perfect sense to leave your garage door open. In winter, if you like to warm-up your car in the mornings, you’re not going to start it and close the door, unless you want carbon monoxide poisoning. But idling vehicles left unattended, even those ‘safely’ in the garage, are a temptation that few car thieves can resist. The risk of having your car stolen is just one of the often-serious consequences of leaving your garage door open, even for a short time. Here are a few more. Attached garages that have entry doors to the house are one of the most common ways that burglars gain entry to a home. Leaving your garage door open for even a short time gives a full view of the layout of your garage and how they can get into your home. Outdoor critters like to find shelter from the elements just like you do. An open garage door is an invitation to a cozy spot. Open doors let leaves and debris blow into your garage. And, if you’re like most homeowners, you don’t need anything else making your garage even messier. If your car is stolen from an open garage, you could be liable for injuries suffered by the thieves. A Bruce County, Ontario, garage owner was found 37% liable for the ‘catastrophic brain injury’ suffered by the 15-year-old accomplice of a car thief who crashed the stolen vehicle. Stolen cars are one thing, but an open garage door is an invitation to take anything in the garage. Thieves can swipe bicycles, lawn mowers, and power tools in just the time it took you to go inside for a drink of water. We should all start thinking of our garage doors as the first layer of security for our homes. If that first layer is wide open, all the other layers are easier to get through. If you’ve never heard of ‘consumer paralysis’, you’ve probably experienced it. It can happen when you’re shopping for something and are faced with so many options, you don’t know which one to choose. Nowhere is consumer paralysis more likely to set in than when you’re trying to find new locks for the entry doors of your home. In addition to the almost limitless designs, colors and finishes, there always seems to be a new technology, like biometric locks or Bluetooth-enabled locks, vying for your attention and offering higher levels of security. But, interestingly, if you’ve ever looked for locks for the largest door in your home, your garage door, you’ve probably wondered why there were so few options. While garage door openers keep the door closed, your choices for locks beyond that are generally limited to regular cylinder locks opened with a key. Garage door opener manufacturer, LiftMaster, is famous for its wide selection in performance, features, and durability. So its no wonder that earlier this year they released a new option for securing your garage door. The LiftMaster 841LM Automatic Garage Door Lock is an add-on accessory that combines the security of a deadbolt lock with technology that allows for monitoring the lock from anywhere with your smartphone using LiftMaster’s exclusive MyQ® app. The 841LM automatically locks and unlocks every time you open and close your door, so you never need to worry about if the door is locked. And you can check if the door is open or unlocked through your phone. Those features combined with the strength of a deadbolt lock, give your garage and home an added layer of security in a place where it might be needed the most, considering that the garage is a popular way for thieves to get into your home. To learn more about the 841LM and all of LiftMaster’s products, please call or visit us here at Markham Garage Door, we’re happy to help. One of the best things about installing a new garage door is that, generally, you can rely on years of worry-free operation from the door. Current door designs and door-opener technologies have advanced to where even average equipment will work dependably (although they may not offer all the features you want). But that reliable technology and operation can become a problem if you fall victim to unscrupulous garage door installers. They know that even some of the cheapest doors and openers, shoddily installed, will work reliably at least for a short period of time. A period of time that is long enough for them to ‘disappear’ and open as an entirely different company – one that is not legally responsible for fulfilling warranty requirements and service responsibilities for your door. So when your door stops working after a couple of years, you can’t find the company who installed it – and who are supposed to service and repair it. Garage door installation scams like this are far more common than most homeowners realize. It’s easy for disreputable companies to set up slick looking websites, slap on a logo to the side of a truck and otherwise make themselves look like a legit business. Some have even wrapped their vehicles in signage to make them look like they’re a reputable company. 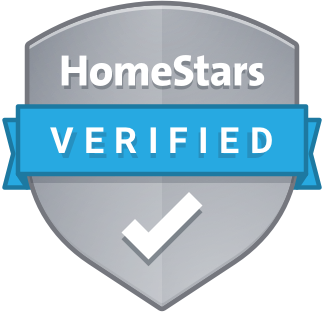 Unlike more regulated industries, anyone can tell you that they are a garage door installer. There is no requirement for them to have certifications, qualifications or any particular knowledge of the business. That puts the onus on you to determine whether or not the company you choose is legitimate. And it’s not always easy to spot the fakes. If you are in the market for a new garage door, you need to do your research with the idea that, no matter how good a door company looks, all might not be as it seems. Here are just some of the things you look for to help you avoid being the victim of a scammer. As you shop around, you should get an idea of what a new door and opener cost, including installation. For garage door companies, there’s no avoiding the costs of offering quality products and installing them properly. If you suddenly get one cost estimate that is distinctly lower than the others, it should trigger your ‘scammer alert’. While there may be a legitimate reason for a lower price on a particular door, like a product promotion or clearance, there’s no reason that one company can consistently offer notably lower prices than another. While some scammers will go to the extent of branding vehicles, many do not. Reputable companies want to promote their brand and are proud to display it on their vehicles, clothing, business cards, and written estimates. Even if there’s a logo on a truck, if that branding isn’t consistent throughout every touchpoint you have with the company, get suspicious. While a website that tells you about products, services, company history and location information is helpful, it should never be your single or most important sign that a company is legitimate. Anyone can whip up a decent looking website that promises great products and services and paints an impressive picture of a company, even if none of those things exist. One of the ways to determine legitimacy is to ask any prospective installers where their office is located. If they hesitate: it’s ‘scammer alert’ time. But even if they give you an address, make sure it’s relatively local (if you live in Markham, and they tell you they’re in Hamilton: ‘scammer alert’). Then take the time to visit the location, look for permanent signage that identifies the company, and don’t hesitate to walk in and ask to speak to someone, even the owner, about the business. 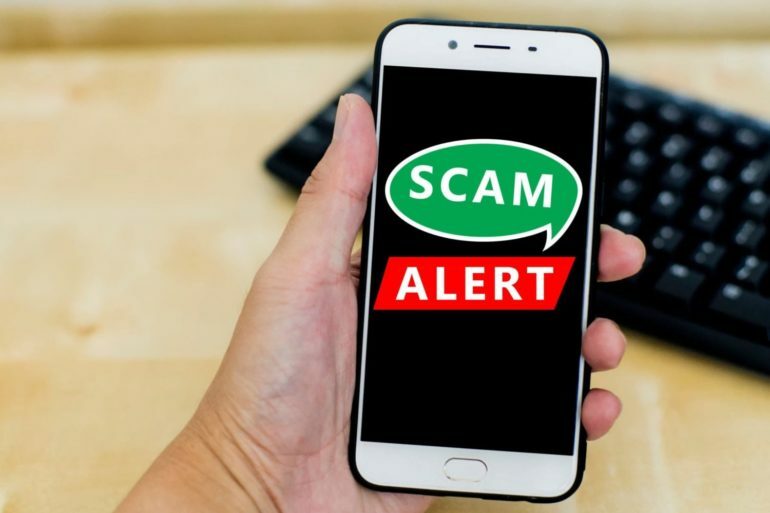 If you feel that something isn’t quite right with a company, no matter how small, use it as a sign of a possible scammer and be extra careful in researching that company. They might be legit, but you need to be sure before choosing them. Yes, unfortunately, it is up to you to make sure you pick a legitimate, reputable company to supply and install your new garage door. But it’s your home and your hard-earned money, so the effort is worth it. For reliable and profession garage door services in Markham and the surrounding communities, contact Markham Garage Doors. Although the winter weather in Toronto and the GTA has been rather mild thus far, it has still been sufficiently cold to elicit thoughts of vacation getaways for many homeowners. Whether the trip includes relaxing on a warm beach, a destination wedding, or a family holiday over school break, spending time away during the winter, even for a few days, just seems to make spring arrive that much sooner upon one’s return. As most travelers are aware, there is a considerable amount of planning that must occur prior to departure. Among the many requisite activities is ensuring that the home will be secure while it is unoccupied; this may include setting automatic light timers, arranging for snow removal, and interrupting mail/newspaper service. And it should also include ensuring that the garage and garage door are secured against unwanted intrusion. Whether the homeowners are away on vacation or just out for the evening, would-be burglars often view the garage as an ideal entry point to a home; this is due to the fact that overhead garage doors often provide easier access to the home than through doors or windows, plus garage doors can offer cover for such illicit activity. By taking these types of measures, homeowners can better safeguard their homes and property against unauthorized access through the garage. Making it much more difficult for potential thieves to enter a home through the garage, in terms of time, noise, and/or the possibility of capture, can indeed deter such activity altogether. Homeowners may choose to take these precautions on their own or through the advice and assistance of a professional garage door service company such as Markham Garage Doors. Homeowners looking to upgrade their home security might consider the installation of a LiftMaster garage door opener, distributed and installed through manufacturer-approved garage door service companies like Markham Garage Doors. For more insight on the LiftMaster series of garage door openers and their installation by Markham Garage Doors, a leading garage door service company in Toronto and the GTA, please visit our LiftMaster Page. Markham Garage Doors offers a full range of LiftMaster garage door openers and related accessories to meet all homeowner needs. Call Markham Garage Doors today at either (905) 472-9178 or (416) 570-3667 to discuss which of the various model options is right for your family and for your home security. Fans of movies or television shows can likely recall a scene when a shop owner locks up for the night by rolling down a metal door or shutter to cover the entrance to the store. The location for this scene is often a liquor store, pawn shop, or convenience store in a high-crime neighborhood, with the implication that the owner is protecting the business against potential break-in/theft. While such a scene is often used for dramatic or even melodramatic effect, the principle is rather sound; using a roll-up/roll-down metal door/shutter to safeguard a property will offer a better level of security than any plate-glass window. And while all commercial or residential neighborhoods are certainly not high-crime, there is soundness to upgrading the protection of one’s property, and the safety of one’s family, in one way or another. When examined in such depth, it should be apparent that Pentagon rolling shutters offer a number of viable advantages/benefits to residential property owners, not only during times when they are absent/away from the premises but also on a day-to-day basis and from a long-term investment/savings perspective as well. To ensure that there is maximum return from their investment, property owners should entrust the design and installation of Pentagon roll-up security shutters to manufacturer-certified distributors, such as the technicians from Markham Garage Doors. By now, the image of a shop owner rolling down a graffiti-covered metal door or shutter to protect their business from potential break-in should hopefully have been replaced by a mental picture of an aesthetically-pleasing and multi-purpose roll shutter from Pentagon. Interested in the many benefits afforded by custom-fitted roll shutters for your home or cottage? Call the experts at Markham Garage Doors today at either (905) 472-9178 or (416) 570-3667 to schedule your no-obligation consultation. It is a common practice for many homeowners to review unwritten checklists and ensure the safety and security of their home before leaving it unattended for any period of time. Even if a home security system is installed, actions such as unplugging the iron or the curling iron, ensuring that the stove elements and the oven are off, and locking all exterior doors are customary steps before getting in the car and going to work or out for the evening. Although such precautions may be part of a daily routine, one aspect of home safety and theft protection that is overlooked is the security of the garage. Residential garage doors provide one of the most common, if not the most common, points of access for would-be burglars, often because the garage does not receive the same attention on a daily basis as the remainder of the home in terms of safety and security. While some of these measures are incumbent on the homeowner-family directly, others can be implemented and/or supported through the services of a professional garage door installation and repair provider such as the team from Markham Garage Doors. The technicians from Markham Garage Doors can recommend and install safety measures that can strengthen the security of a garage door against unwanted intrusion or damage. For many families, their garage may actually be the principal source of entry and exit for their home. The garage may also serve as a primary storage area for equipment, tools, furniture, and, of course, vehicles for both residential and commercial property owners. Therefore, from the standpoint of the safety and protection for occupants and property, garage doors will undoubtedly play integral roles. Give your home added protection from unwanted intruders by upgrading or enhancing the security features of your garage door and its accessories. Call the professionals at Markham Garage Doors today at (905) 472-9178 or (416) 570-3667 to arrange a no-obligation consultation or a service visit at your earliest convenience.